Every year, I am kind of tongue tied at New Year. All I can think of is "Groan, the holiday season is over. Kohl's is no longer open until midnight, there is no valid reason to switch on the fairy lights every evening and I have to go back and finish all the work I had pushed aside to be done 'after the holidays'." You can see that trend in last year's post and in the year before when I had actually thought I should keep shut and not blog much anymore. Thankfully, I woke out of that. 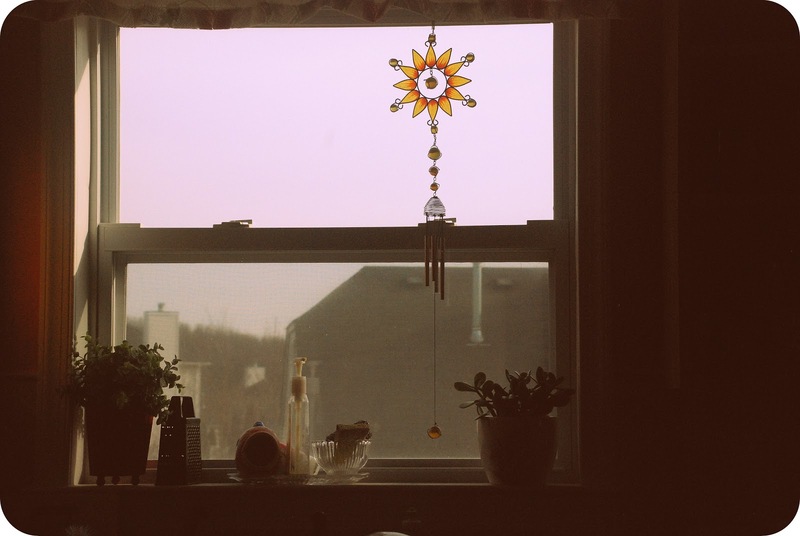 I love to be here, to blog and I have also realized that it is okay to do it at my own pace. I have been blogging for 6 years now and I don't even have 500 posts to boast about but I think I have kind of found the balance so that is fine. I do not have any resolutions for the next year or any looking back to the last and this sign is what I will try to live my life by every day (though I have no clue what citi pond is). 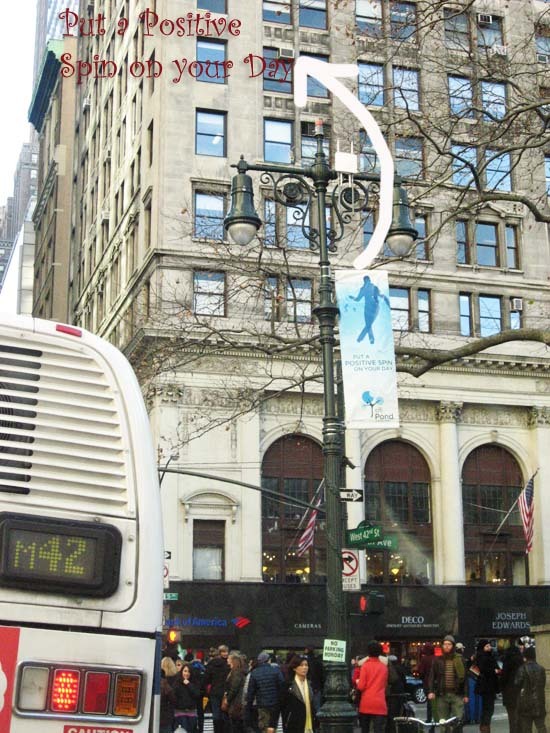 This other picture that I took in the city last week kind of reflects what I expect every year or rather day to be. I hope it is tall and glamorous with shiny windows and hanging verandahs but I also know that it can just be chipped walls and cracked window panes. In that case I at least want it to be happy, bright and colorful. Hope your and mine New Year is filled with color, brightness, good health, happiness. Here is a recap of recipes from each month of this year that was most liked by someone or the other(read myself, family, friends, readers, spammers). The last few days I have been reeling under a sense of helplessness. As have been many others. 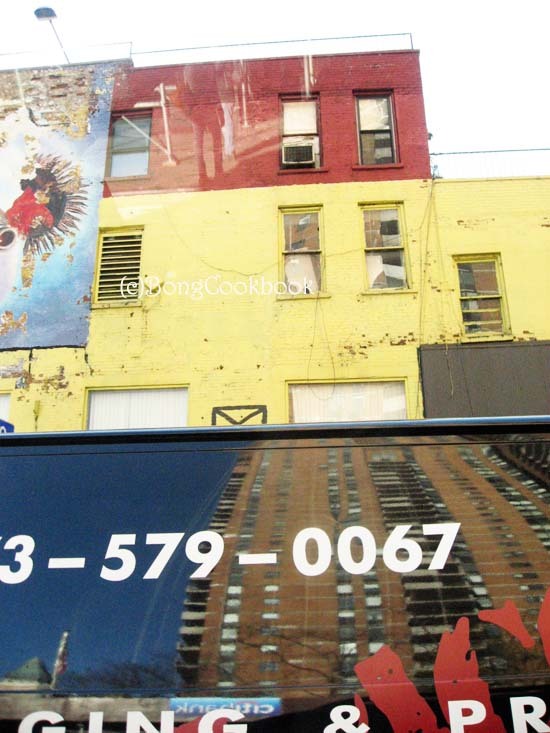 A school in Connecticut, a bus in Delhi, different situations, different countries and the same loathsome, monstrous nature of the human rearing its head. Being in a position where I can do little except e-mailing the principal of my daughters' school or voicing my opinion in certain online places, the helpless feeling has been gnawing my innards. I question my existence, my inability to do something to better the situations and all I have been feeling is immense sadness. Every time I have tried to sit down to write something here, words have seemed inadequate and meaningless. However when you are a parent, you learn to have faith, to hope, to look forward and then make a cake for the one who turned nine. You also learn that cooking and using a lot of butter helps in that direction. Now husband-man says that it is the banana which has the chemicals to make you happy but I think it is butter aided with loads of sugar which actually does the trick. In the last 21 days of my attempt to make more inglish-vinglish recipes, I have bought and used as much butter as I would have probably done in a whole hunk of a year. I have never really been a very "butter" kind of person. Those creamy sticks do not turn me on and except for a lick of Amul butter here or a smear on my toast, I choose to stay away from them. Of course if I had chosen salads instead of cookies and brownies, the butter story would be different. But then what is inglish-vinglish if not an ooey gooey chocolate cake or a buttery cookie? For everything else there is alu posto. Now many of you who read me know that I not the best of bakers, nor am I the worst of bakers. I mean I was worst, but not anymore. I have mastered enough control on my ADD to stick to 1 Cup of AP flour if the recipe says "1 Cup of AP Flour". Earlier I would have translated it to 1/2 Cup of Wheat Flour plus 1/4th Cup of Flaxseed Flour and then skipped the baking soda. But I still have enough fear of beating butter and sugar to creamy or egg whites to stiff peaks. I try to avoid any recipe that asks for egg whites to be separated and dutch processed cocoa to be bought. Well, I also try to blame my incompetency to the absence of a shiny Kitchen Aid but guess no one has fallen for that yet. Last week I baked this Chocolate sheet cake from Pioneer Woman.And I tell you it is the easiest and best chocolate cake I have ever made. It has loads of butter but not a single step that instructs you to beat butter and sugar. Easily my kind of cake. It is also really, really, really good. And that frosting on it is to die for. Being a sheet cake it is not that thick and makes 20 to 30 squares depending on which size you cut it. I think it is the best cake you can take to a party or potluck. We kept a large portion of the cake cut in squares in the refrigerator and ate it over 5 days. I would warm mine to make the frosting ooze. BS , LS and the Dad like the cake cold though. If you have not soaked your dry fruits in rum (like me), give this cake a chance. Chances are Santa might just fall for it. In a wide mouthed mixing bowl, add 2 cups of flour, 2 cups of sugar, and 1/4tsp salt. See, no sieve or anything. Cool isn't it. In a saucepan, melt 2 sticks of butter. To it add 4 heaped tbsp cocoa. Stir together. While butter is melting, start boiling a little more than 1 cup of water. Once you have mixed the butter+cocoa, add to it 1 cup of boiling water. Allow the whole mixture to boil for 30 seconds, then turn off heat. Pour over flour mixture, and stir. Mix so that the flour mixture mixes uniformly with the coco mixture. In a measuring cup, pour 1/2cup buttermilk. To it add 2 beaten eggs, 1 tsp baking soda, and 1 tsp vanilla. Stir buttermilk mixture into flour+chocolate mixture. 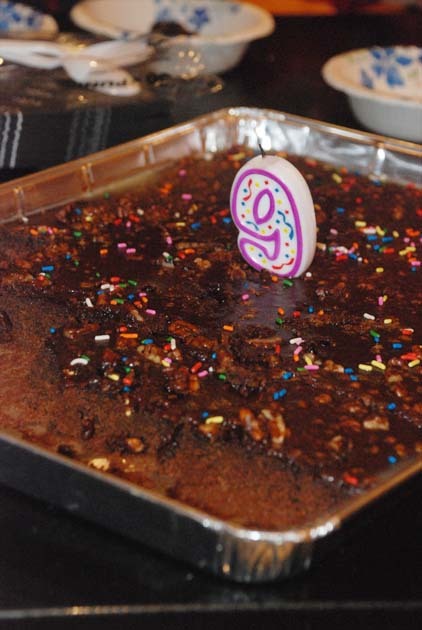 Pour into sheet cake pan(18 x 13) and bake at 350-degrees for 20 minutes. While cake is baking, make the frosting/icing. I started around 10 mins after the cake went in the oven. Chop pecans finely. Melt 1 whole stick + 3/4th of another stick of butter in a saucepan. Add 4 tbsp cocoa. Add the chocolate chips. Stir to combine, then turn off heat. Add 6 tbsp milk, 1 tsp vanilla. Now add the sugar. Now this cake is pretty sweet so I went less on the sugar in frosting. I used about 1&1/2 cup less than 1 lb of confectioners sugar. You can adjust this according to your taste. The original recipe asks for 1/2 cup less than 1 lb sugar. Mix uniformly to make a ooyey gooey chocolate frosting. Add the pecans and mix again. Once the cake is done, take it out and pour frosting over warm cake. You can eat the cake warm or cold. We liked it both ways. This holiday season I have decided to take a resolution. Yes, it is better to have a resolution for just one month than the dreaded life long one in January. This way I can always concentrate on better stuff in January, like the chocolate covered cupcakes. So I have resolved to cook more inglish kind of dishes this month. Now inglish does not necessarily mean English; it can be Italian or Moroccan or anything but Bengali. Inglish as in stuff my Grandmother had never heard of and would probably refuse to eat otherwise, stuff my Mother might have heard but never been interested to try them at home, stuff I have heard, probably tasted, some not tasted but never been too enthu to try them out at home. But all that is going to change for I have had enough of being the "Bong Mom" and cooking or at least blogging about more or less "Bong Food". 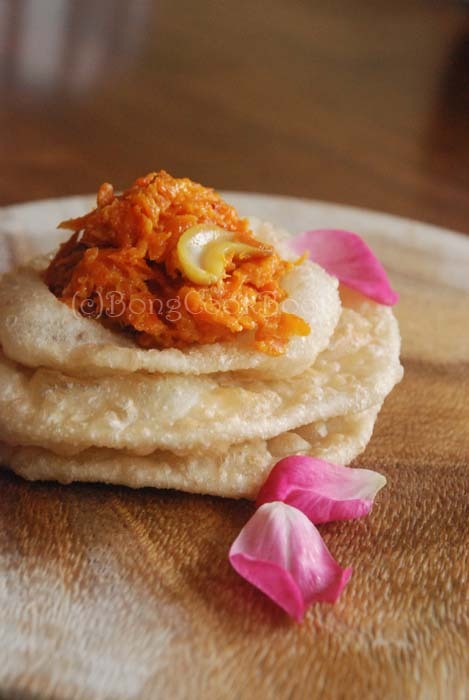 Six or some uncountable years ago when I started this blog I couldn't cook a charchari from a labra. I couldn't make an ossobuco or pasta carbonara either. But true to my family roots and some crap about passing on my Bengali legacy to my daughters, I went the charchari route. And now see what has happened ? Every person from Madhyamgram to Mangalore and Patuli to Patna is cooking Beef Burgenoff (or maybe stroganoff) and Mushroom Risotto with a flourish and baking perfect pots of de la creme or something. And what am I doing ? Cooking bandhakopir ghonto and still trying to figure out how or why a dessert spoon is different from regular spoon. See what a disgrace I am to my Mother, the poor thing who not only sent me to a inglish school but spent a good part of her life to get me the perfect bloomers for phys ed ? 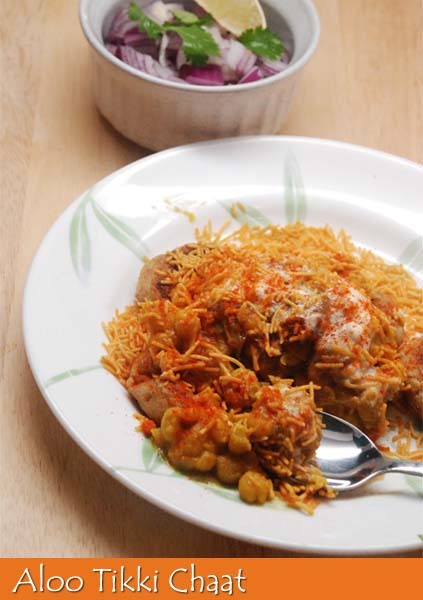 Instead of apple crumble I write posts on kopir datar charchari. And it is not that my finesse in those stuff is exemplary or something and can be compared to anyone's grandmother. But let me also tell you. The entire thing is not my fault alone. Now that I look around, I see grandmothers in Malda were apparently making tarts and vanilla bean cookies at the time mine was merely stirring a Paayesh. No wonder I have no heirloom recipe for such delicacies and am forced to write sentimental posts about Ilish Maacher Tauk. Chhayh !!! So enough of all that ghyyant-charchari-jhaal-jhol-ombol for December. Ossobuco here I come. Wait, that is too much of a leap for me. 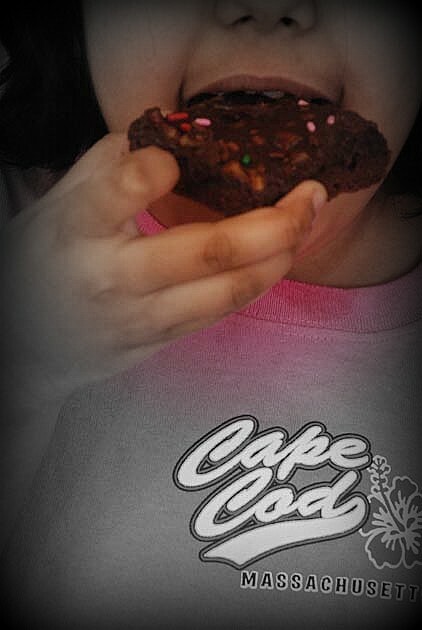 For now we will take baby steps with cookies. So oatmeal raisin cookies here I come. And since I have no hand-me-down recipe for such I am following exactly what Smitten Kitchen has. The larger part of Saturday, I spent making cookies which failed miserably batch after batch. That story I will tell you in the next post. It was this batch of oatmeal raisin cookies which saved us and led to the source of the problem. The wrong oven. As in our new toaster oven which due to its newness or something was blaring off heat at 400F when we set the temp at 350F. No doubt the cookies crumbled or rather burned. 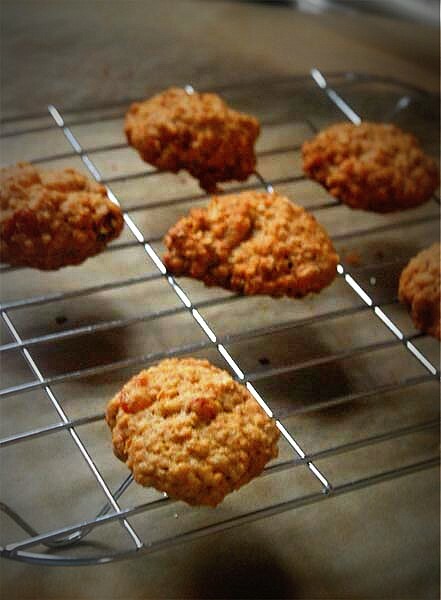 The oatmeal raisin cookies being larger in number were baked in the larger, regular oven and that seemed to solve all our troubles. Though I must say here that we had many self-doubts while beating the butter and sugar, while mixing the flour with the butter and sugar, while adding the oats at which point I asked the husband-man to come and lend his expert hand and also Alton Brown-esque knowledge. He said something about the dough not having enough elasticity. They made pretty good, golden colored oatmeal cookies. They were thick and chewy. They did not taste as good as a Pepperidge Farm Soft-baked oatmeal raisin cookies but then I am partial to soft-baked cookies and I have not grown up with oatmeal cookies to compare against. 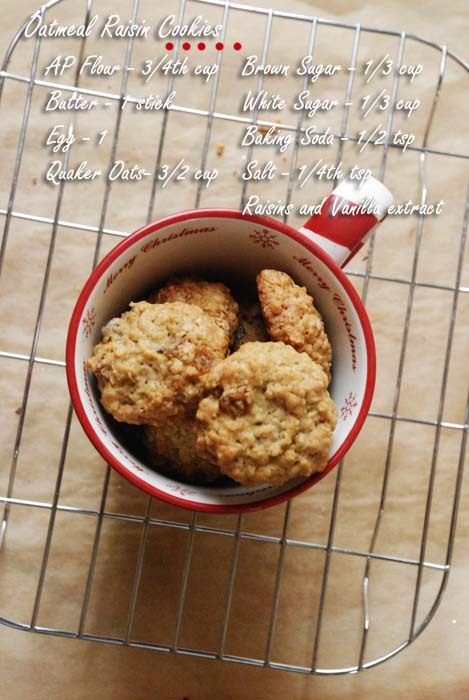 Given that this recipe was from Smitten Kitchen and looked like hers , I am sure this is how oatmeal cookies should be. BigSis loved and ate many. LS merely liked and used them to draw imperfect circles. 1. In a bowl whisk together the AP Flour, baking soda and salt. 2. In a wide mouthed bowl cream together the butter and sugar. I used my hand mixer for this which I am not very prone to use. Once the butter and sugar have come together to a creamy consistency and tastes smooth and sweet add the egg. Now beat again until you get a smooth end result. 4. By this time the dough was pretty tight and it seemed impossible for 1& 1/2 cup of oat to mix into it. But voila !!! As you mix the oat in with the spatula it does all go in. Be patient. Stir in the raisins next. And the chocolate chips if using. 5.Chill the dough for half hour. 6. Pre-heat oven to 350F. Meanwhile scoop out portions of dough on a parchment lined cookie sheet. Don't crowd them and give them enough space, for those blobs will expand. 7. Bake them for 10-12 minutes. Now this time will totally depend on your oven. In my larger regular oven by 12 minutes the cookies started having a golden edge. However in my new toaster oven, by 8-9 minutes the edges were getting burned. 8. Take out the cookies when the edges are golden but the center is still a tad soft. As Smitten Kitchen's Deb says, let them remain on the hot cookie sheet for 5 mins. Only after that cool them in a rack. 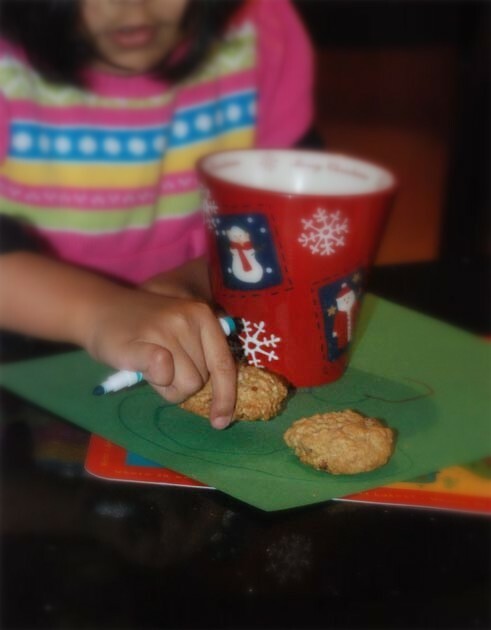 These oatmeal raisin cookies were thick, chewy, very oatmeal-y. The two adults and the almost 9 year old loved it. 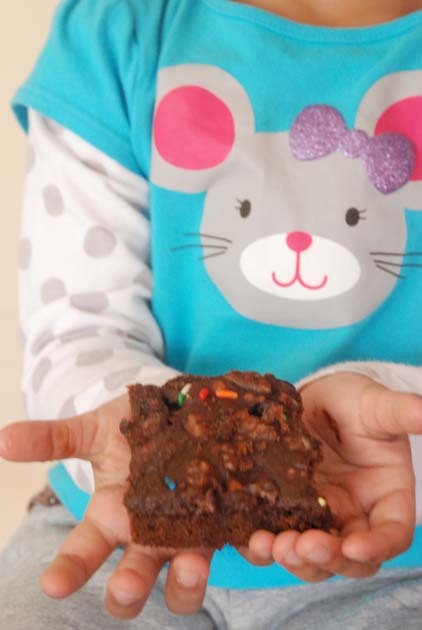 The four year old was more in love with the baking process than the cookie itself. The days have become real cold here. There are some beautiful warmer days scattered in between but mostly it is cold. My Mother says this winter in Kolkata is unusually cold too. But I am sure it is nothing like here. There, the cold has a distinct fragrance. If trapped in a bottle and named "Le Winter" it would smell like wood smoke, laced with sweet nolen gur, spiked with a hint of citrus-y komla-lebu, all layered on an undertone of napthalene scented kashmiri shawls. Okay, you might also bring in smog but I like to think that the winters I spent in my Dida's house years ago almost always smelt like this. Also of slightly burn toast with orange marmalade. Here, it just smells clean and crisp and not cold at all if you are indoors on a sunny winter day. But then you slide open the glass door to the backyard an inch and through the fine wire mesh comes the cold, brutal and sharp. But we have gotten used to it. Except for the gloomy cold days, which I dread, we kind of like the sunny wintry days. It is always about the sun , isn't it ? We get by, neither fearing winter as much as I did earlier nor looking forward to snow with as much excitement as my first time. Of course the kids bicker about wearing jackets and boots and ear muffs and zipping the jacket all the way and other such clothing issues, I bicker about cold tiled floors and not having enough drapes for the windows yet, the husband bickers about my need to rush outside or rather make him rush outside for all kinds of groceries at odd hours. "Why do you need vine ripened tomatoes at 8 in the evening ? ", he asks. As if, there is a time for such things. 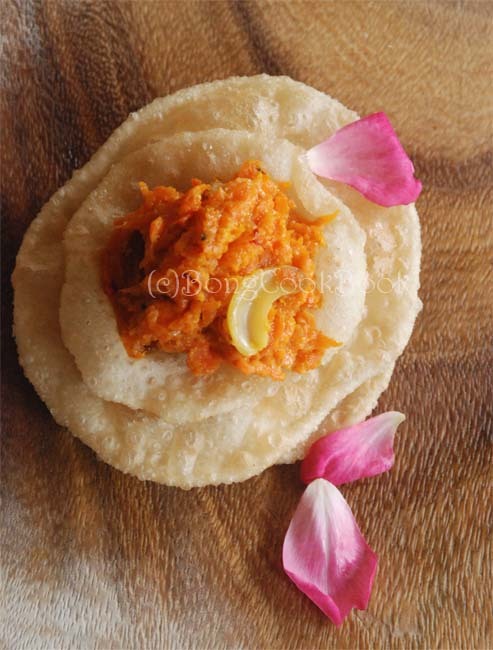 As if the need for firm, ripe on the vine tomatoes arises after consulting the Ponjika for the right muhurtam. 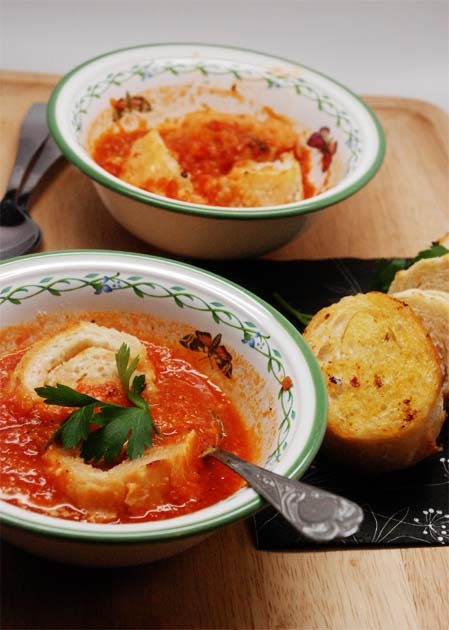 As if just because tomato soup was never my thing, I can't crave a bowl of warm tomato soup now. As if just because the only tomato soup I would ever have was the creamy deliciousness at Nagarjuna in Banglaore and whose recipe I do not know, I can never try to make another one. As if, if a recipe is easy and can translate to quick dinner I will let that opportunity pass. Do I look like a fool ? But this day I had only one tomato in my refrigerator and half a can of Hunt's Diced tomatoes. And I craved a tomato soup, a hot (as in the temperature) one. Of course no sympathetic soul was venturing to get me vine ripened tomatoes shipped from Florida and currently in residence at the neighborhood grocery store. So when I saw this tomato soup, I took the plunge. And good I did, and good I had the canned version too, for this soup with a Michelin tire tomato would have not tasted half as good. Too many "good" there but that is how this soup is. The bread makes it special. And surprisingly both the girls ate it with much eagerness. Either they were very hungry for it was a school day or this soup was good. I am sure they will refuse to eat it by the fourth time or the fifth. I can't stretch my luck. But hopefully by then I will move on to another soup. Heat some Olive oil in a deep, heavy bottomed pot. Add 2 cloves of garlic minced and a medium sized onion finely chopped. Saute till the onion has turned soft and pink. I also added a carrot peeled and cubed to add some sweetness to the soup but it is not in the original recipe. Now add the tomato. I added 1 medium sized tomato chopped and about 3-4 cups of diced tomatoes from a can. Note: In an alternate version you can cut plump, juicy tomatoes in half, dust them with salt, drizzle with olive oil and bake for 30 minutes in the oven for 350F. I throw in some cloves of garlic along with the tomatoes. Yellow and Red sweet peppers are another great choice. Sprinkle salt to taste, a little paprika, 1/2 tsp of brown sugar and mix. I also added a bit of cajun seasoning which I happened to have. Now let the tomatoes cook at a low medium heat. Stir in between and wait for the raw smell to just go evaporate. Next add a cup of water and about 1/2cup of milk and stir to mix everything. With an immersion blender, blend the soup. Let the soup simmer to a boil. Taste at this point and adjust for seasoning. Meanwhile, cut chunks of bread, douse them with olive oil and throw them in the toaster oven to toast. Lightly toasted is what you want, not crisp like croutons. 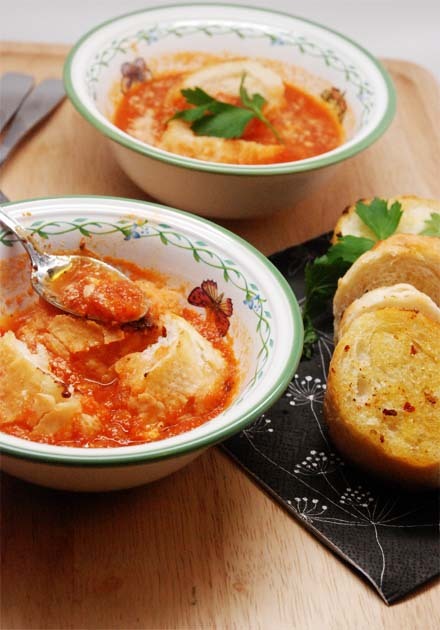 While serving ladle the soup out in a bowl, add grated parmesan and toss in the chunks of toasted bread. Sprinkle salt and pepper to taste and eat it to warm your chilled bones. Heat some Olive oil in a pressure cooker. Saute till the onion has turned soft and pink. I also added a carrot peeled and cubed to add some sweetness to the soup but it is not necessary. Now add the tomato. I added 1 medium sized tomato chopped and about 3-4 cups of diced organic tomatoes from a can. Note: In an alternate version you can cut plump, juicy tomatoes in half, dust them with salt, drizzle with olive oil and bake for 30 minutes in the oven for 350F. I throw in some cloves of garlic along with the tomatoes. Yellow and Red sweet peppers are another great choice. Sprinkle salt to taste, a little paprika, 1/2 tsp of brown sugar and mix. I also added a bit of cajun seasoning (optional) which I happened to have. Saute for a couple of minutes for the raw smell to just go evaporate. Next add 2-3 cups of organic vegetable stock, salt to taste and close the lid of the pressure cooker. If you don't have stock, go with water. Cook until -- In a whistling pressure cooker, 3 whistles and in the other kind, 3 mins after full steam. Once it cools and you can open the pressure cooker lid, with an immersion blender, blend the soup. Taste at this point and adjust for seasoning. Add 1/2 Cup of milk and let the soup simmer for 2 more minutes. It has been almost two months since we left our old kitchen and moved into the current one and slowly I am settling into its ways. I still get confused that the cutlery drawer is not to my right when I am making tea but on the left. On the right is the spice drawer which I keep opening absent minded looking for the odd spoon. Also the sink faucet is the exact opposite of the standard for hot and cold. We can change it but haven't yet and once in a while I am thrown off by the left which is cold while right is hot ! This has helped me get further confused when I am visiting friend's where the faucet has the standard setting. So officially my brain is addled with which is which and now I can never trust myself to open a faucet and get water at the temperature I want. But there are things I love about this new kitchen. The first is of course the sun, the sun which this side of the house gets in plenty, all through the day. 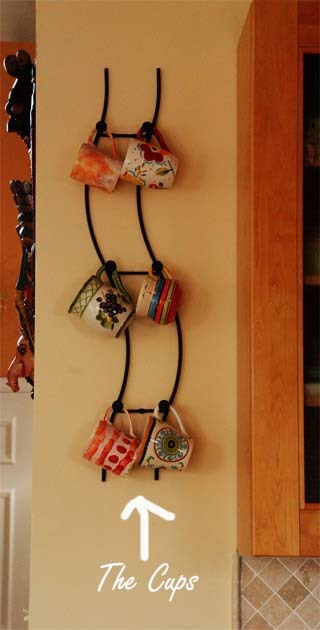 Next is the lazy susan in the corner cabinet.I have always loved that arrangement in other homes and I really like it filled with all my spices.Also the fact that now I have an ample pantry right in the kitchen is a big bonus. The kitchen as always is not entirely mine and shared by everyone. 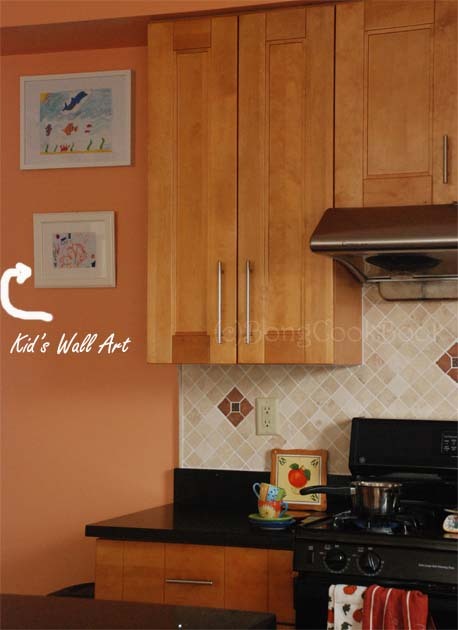 The girls do their homework and painting/coloring on the kitchen island all the time. I had this blank wall which I thought I would set up as a display of the girls' art work. Whatever picture they draw can be put into those frames and we can have fresh new art on the wall every week almost.Don't you think that is a great idea ? I am planning to do the same for their bedroom too. Earlier I had a cork board and the refrigerator was the major place for all art display. But the framing fills my walls and so serves double purpose. 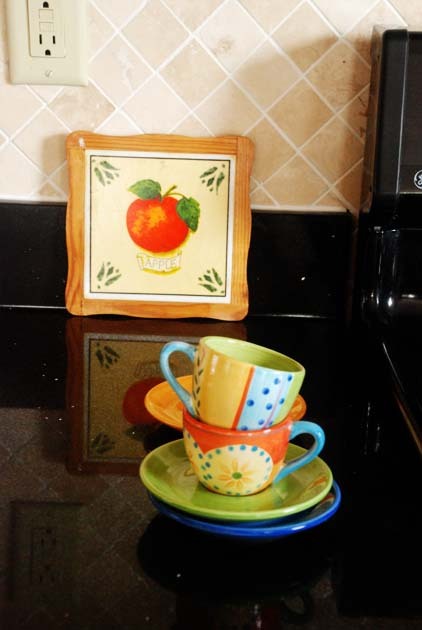 As we put in our own touches and cook more I will post more pictures and I am sure you will grow to love this kitchen as will I.
I loved this post of Pia's so much that her statement "Creativity is Subtraction" is etched in my mind. 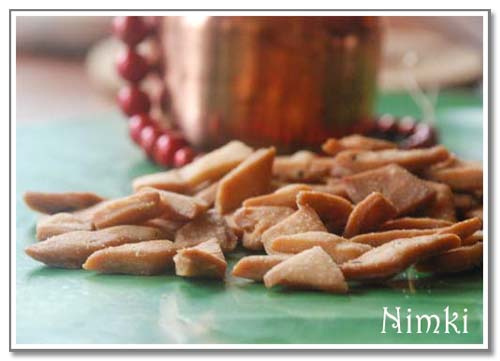 This holiday I want to try my hand at baking cookies, simple ones, even probably nankhatai or nankatai. We will see. A friend who is a talented designer, has worked with the weavers of South 24 Parganas to design and create a new line of sarees. Each of those pieces are so beautiful and the color palette is so rich and striking that you must take a look at her Facebook Page. Since the sarees are designed by her, each is a unique piece. You can e-mail her with questions about the sarees. 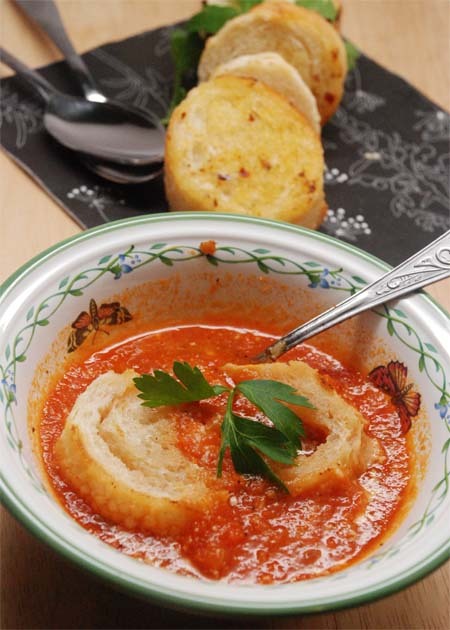 See you all soon with an easy Tomato soup just right for the cold weather here. This Thanksgiving started out special. Early morning, my Mother called. From halfway across the globe.And said "Thank You". I was like "Ehhhhh...whaat ? Whyyy? Keno ? Shob thik ache? Are you ok ?" And then she said "Thank You for being my daughter". That was such a shocker that whatever remnant sleep I had in my system flipped and did a bolt out of the door. "Keno? Ki holo? ", I asked frantically trying to think what might have caused my Mother to behave in such a manner early morning. We have never been a polite "Thank You", "Please" family reserving such atrocious behavior only for strangers and so such words coming from her sounded more alarming than endearing. "Aajke Thanksgiving to. Eikhane FM Radio te phone kore shobai rickshaw wala ke Thanks diche. Ami bhablam toke diy( Just heard today is Thanksgiving and people are calling FM radio here in Kolkata and sending out Thank You messages even for their rickshaw wala. So I thought I might as well thank you)", my Mother, a woman of the world, tried to justify her behavior. I breathed a sigh of relief. All was well. I am immensely Thankful for my Ma but I have never ever been able to tell that verbally. But then my FM radio blares NPR and does not give me such good advise Phewww. Several years here and yet we have not much of a Thanksgiving tradition. I mean "not much" if you ignore the fact that most years we end up at a close friend's home driving 3 hours, 2 states away to spend the Thanksgiving weekend lounging on their couch. It is something we do without much thought. Maybe because airports are too crowded during the four day vacation or maybe because the friend's pastel green couch and warm heart beckons to us stronger than the sandy beaches of Jamaica. Or it could also mean scrumptious free food that one does not have to cook and hence clean up after is the main motivating factor. The point of the matter is we have never re-visited our decision as to why this has morphed as a repetitive process in our life. That a repetitive process also translates as a tradition is something that had never occurred to me until last Wednesday. Last Wednesday, the day before Thanksgiving, BS's teacher asked the class to write something about their Thanksgiving tradition. BigSis said :" Well ummm we don't really celebrate Thanksgiving as a tradition...ummm"
Teacher: "Is there anything you do on that day ?" BS: "Yes, yes, every year on Thanksgiving we visit our cousin(read friend's daughter) and her family and have fun at their place"
Teacher: "Well then that IS your Thanksgiving tradition"
A visibly relieved BS later told me that at least she had some sort of a tradition on Thanksgiving to write about, her class mate V merely stayed home and spent it like any other day and had nothing interesting to write. Well every thing you do ultimately finds a way to be useful to someone somewhere. And lets not forget the free food. This year though unbeknownst to BS we (as in the precious group of real life friends I have here) had planned a traditional Thanksgiving pot luck lunch, a lunch before we continued on our next tradition of spending the days with the other friend. We had never done a traditional Thanksgiving meal before, the times that we had done something it was always leaning towards something Indian. This year led by a friend(we will call her M) who is a fantastic and talented cook we fell in line with a traditional Thanksgiving meal perfumed only mildly with cumin, coriander, and Mustard oil. 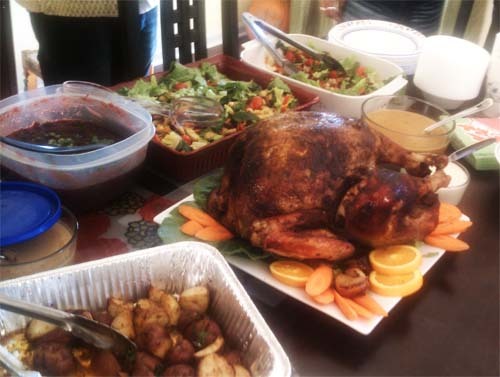 The said friend took upon a 19lb Turkey by herself and in face of our doubts, doubts that a Bengali soul will always have faced with a Turkey, cooked a bird which was so delicious that I will now look at Turkey --the bird that is, with renewed respect. With creole seasonings and hours of brining and marination, she had made the bird so moist and delightful and perfect that it was beyond our masoor dal-bhaat imagination. The Turkey had the prefect accompaniment in a stuffed turkey breast(by friend J), a wonderful colorful salad(N's Dad), green beans, roasted potatoes(me), gravy, cranberry relish(me), shrimp scampi( by another friend J),soup, more vegetables and scrumptious brownie. It was truly a beautiful and delicious Thanksgiving meal. 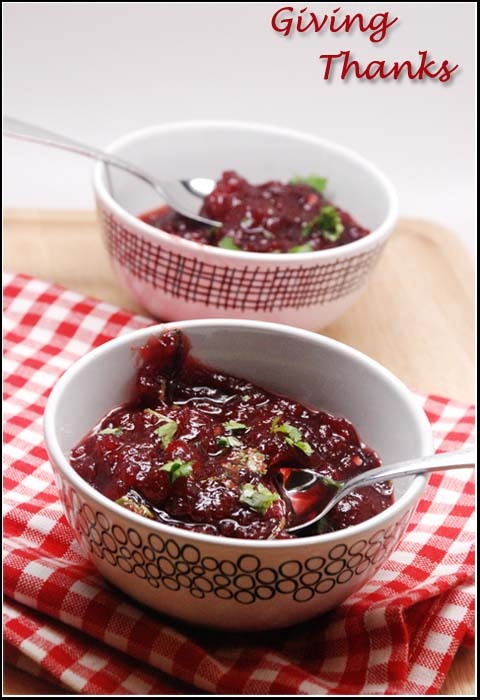 Now if you don't get Whole Berry Cranberry sauce , you can make some with fresh cranberries. If cranberries is not local to your place, don't even bother, find something else. But and take note--but if you do get cranberries in can or not, do attempt making this relish or chutney or whatever. It is really, really good. And yes, remember to wash that finger. Not that it is a must but it helps to promote World Peace. I will end this post with words about an organization I received an e-mail about. I haven't had time to look into details but is clear that the non-profit org More Than Me, that works to lift girls off the street and into school in Liberia, West Africa is doing a worthy job. Do check out www.voteabigail.org and More Than Me. Yes, yes, Yes. We have a Giveaway winner. Before I announce the winner let me just tell you how I picked the person today. 1. First I entered all the commenters in the order they had left their comment on the blog in a spreadsheet. 2. Since there were some exclusive comments on FB, I added them to the spreadsheet, inserting them in order according to date and time. So some FB comments went in between the blog comments in the spreadsheet. 3. You can see the spreadsheet here. 4. There were 47 rows in there. 5. Next I went to Random.org where I put Min=1(lowest row num) and Max=47(highest row num) and hit Generate. The random number thus generated was 18. 6. The 18th row in the spreadsheet had the name Newly Paul. Drum-roll. And she is the winner of the gift card today. Woo Hoo. Congratulations. Newly Paul, I do not have your e-mail address.Please leave a comment with your e-mail or drop me a line at sandeepa(dot)blog(at)gmail(dot)com. Also let me know the charity of your choice and we can decide how you want me to contribute to them. All others, thanks so much for playing along. We will have another giveaway soon hopefully and there is always a chance that you will win next. I love this time of the year. Not because it is winter which is really not my favorite season but because of the festivities which come tumbling one after the other. 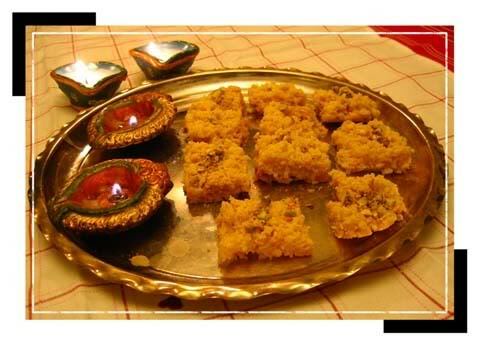 DurgaPujo, Halloween, Diwali, Bhai Phota, Thanksgiving, Christmas, New Year dazzles the calendar until December. Even while we are recovering from the aftermath of bhog-er khichuri, sondesh, nimki and naru there is a fifteen pounder turkey looming in the horizon. But being true blue Bengalis we march towards that horizon without fear. With a couple of bottles of hajmi guli we are ready to conquer every feast that any tradition can throw upon us Our only regret is that had the pilgrims known better they would have surely decided on "pathar mangsho" instead of turkey for Thanksgiving. But this post is not about Thanksgiving. It is about a tradition stuck in between the holidays called Bhai Pho(n)ta. It is a day when Bengali sisters deem to protect their brothers by putting a dot of sandalwood and yogurt paste on their forehead. A sweet ritual to reinforce the sibling bond and spread some food and cheer in the process. Big Sis and Little Sis are blessed that they have a loving extended family of Mashis and Kakus all around them. A model elder sis to look up to, best friends who double up as cousins and younger brothers and sisters of all ages. The set up is almost as good as a joint family without the added baggage. 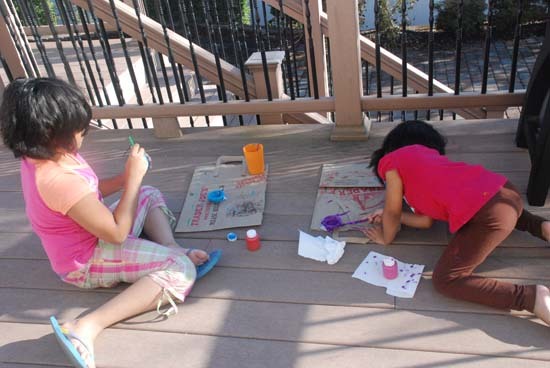 I can let BS have sleepovers without a thought at her BFF's home because they have practically grown up together and I know these are the homes where the children are loved without judgement. So it only natural that the two little cute and smart twin brothers whom BigSis had visited only few hours after they were born and have practically seen grow up are also the ones whom she gives Bhai Pho(n)ta. It comes naturally to her, to protect these little brothers and wish them well always. LittleSis too was initially excited to give them phota but threw a major tantrum during the occasion vehemently refusing to have anything to do with the rituals. 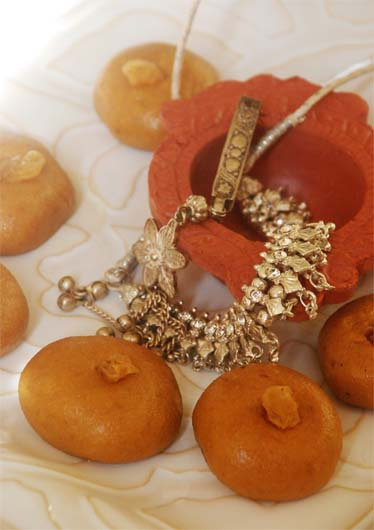 Along with the chanting of the rhyme, the sandalwood-yogurt dot and sweets we celebrate this day every year with lots of food. This year Kakima, my friend N's(the twin's mom) mother is visiting and so most of the wonderful food (which included a tasty salad by N's dad, shukto,dhoka and a rezala) was cooked by her. All I did was make a Roshogollar Paayesh and Keemar Chop. Now this Keemar Chop is not really like the Mangshor Chop my Ma makes. Hers is a little more complicated where she makes an outer casing of potatoes and stuffs it with spicy mutton keema which she then dips in egg wash, rolls in bread crumbs and then deep fries in hot oil. My Keema Chop however is simplified; like everything else I do in life. Haven't heard anyone complaining though. Heat 2tbsp oil in a fry pan. Add 1 medium sized onion finely chopped and fry till it is soft and pink with browned edges. Add the chicken keema. Add salt to taste. Mix well and cook the keema with the spices until keema is no longer pink and is cooked. Sprinkle 1/4tsp of Garam masala. At this point taste and adjust for seasoning. Once the keema is done, cool. Then add it to a blender and give a whirr to make a crumbly kind of mix. Do NOT blend to a fine paste. Meanwhile boil 2 large potatoes.Once cooled, peel and mash with salt to taste. Scoop out small portions of the above mix and fashion them into thick disc shapes or oblong shapes. 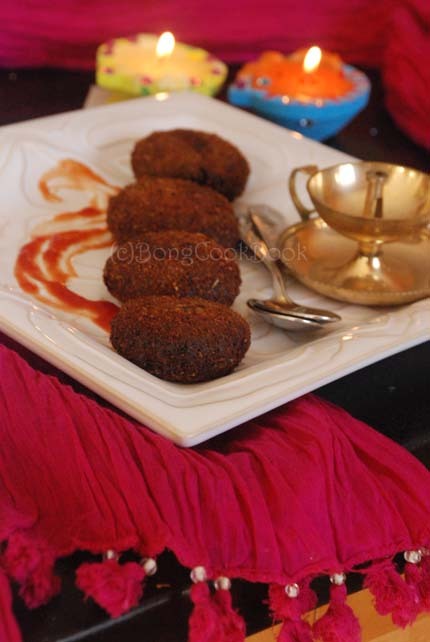 Dip the chop/croquette in egg wash --> roll in bread crumbs --> fry till golden brown on both sides. 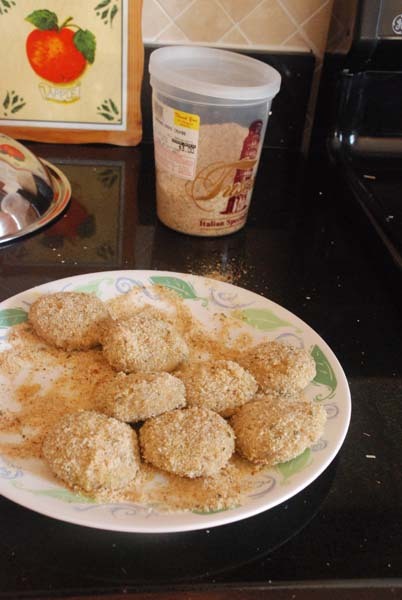 Note: I have noticed that after the chop/croquettes have been rolled in brad crumbs if you let them rest in the refrigerator for half hour , the coating is better. The giveaway winner will be announced tomorrow night. You still have time to participate. While everyone else was making sweets and wearing silks on Diwali I was making this aloo tikki chaat in yoga pants that has seen better days.And why ? For the simple reason that I had soaked some yellow (or was it white?) vatana in the morning to make ghugni and suddenly just a ghugni for dinner did not seem right on Diwali. I am ashamed to say but that was the most I could do. 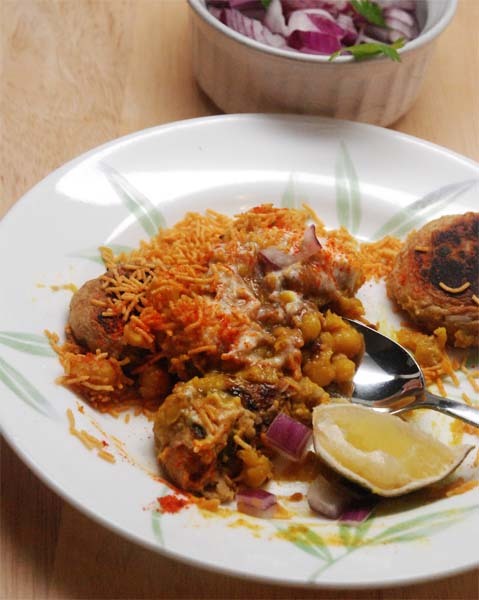 In light of all your karanjis, besan ladoos, gulab jamuns and murukkus my struggle to put together a plate of "pick-me-up-and-have-a party-in-your-mouth" aloo tikki chaat seems to fizzle out like a damp cracker. But guess what ? It was okay. At least I thought it was okay. Only I cribbed about the fairy lights that would go on the front porch in our old home and that still remained in their cardboard box, resting, probably itching to get out and spread some light. We weren't able to put them up here. Not yet. Those lights will have to wait till we figure out how to put them up in this front porch with a different facade.It is the lights I worried about most. 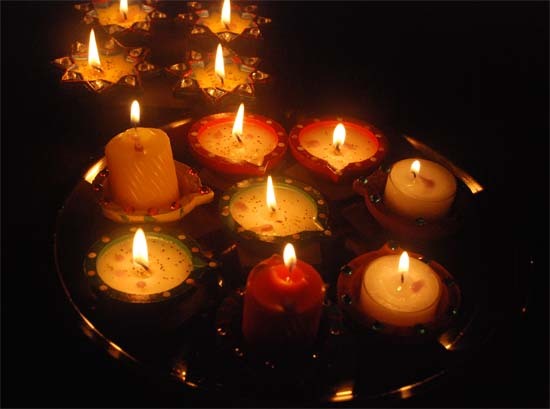 For Diwali to me is more about flickering, twinkling, bursting lights on a dark autumn night than anything else. Now to the aloo tikki chaat which as everyone and their neighbor's dog knows is a famous Indian street food. Only thanks to my street food phobic mother I never tasted it at a street-side. 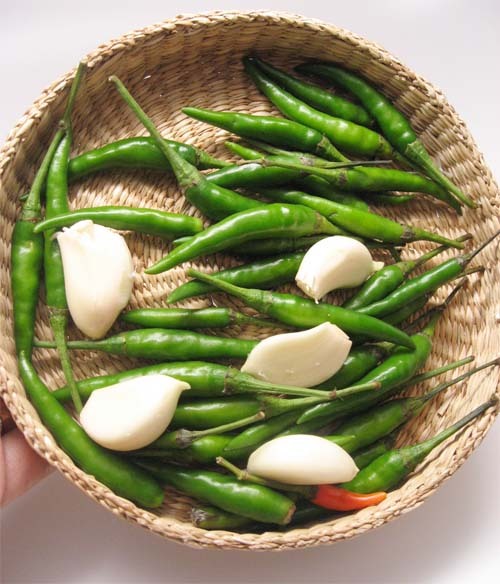 I have spent many school afternoons looking longingly at the tikki wala standing behind a huge disc of greased tawa--flat discs of aloo tikkis and green chilies adorning its periphery--stirring around a ghugni with a non-chalance that was enviable. Bevy of school girls, usually the high schoolers surrounded his cart as he went tan-tan with his steel ladle on the iron tawa. I have no idea how it tasted, all I can remember is my Ma talking about the steel plates he used not being properly washed and some such reasoning to prevent me from having it. At this point I can only thank my stars that Ma was not that strict when it came to phuchka or egg roll. Phewww...can't imagine what my life would have been otherwise. So the point of the matter is I have always had aloo tikki chaat at sanitized surroundings, in small restaurants, a step away from the street, and it has tasted as good as it can in that surrounding. I have nothing to compare it against. Same goes about mine. It is good. Pretty good. But I have a niggling doubt it is not as good as that tikki wala's who sat outside the huge green gates of my school. 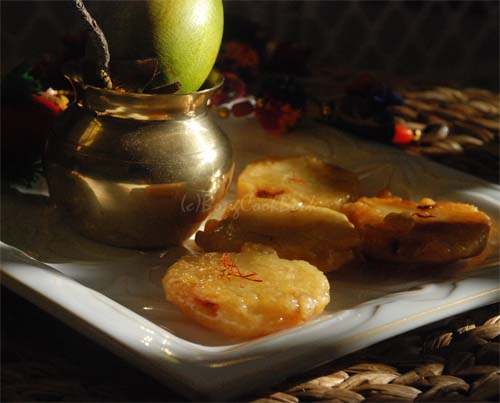 There are several recipes of aloo tikki chaat or ragda patties. The aloo tikki is a spicy potato patty which is shallow fried and the ragda is a spicy peas curry kind of thing. The aloo tikki chaat can be just the potato patties itself topped with all the tamarind chutney, sev and other chaat paraphernalia.My girls love the aloo tikki by itself, at least BS does. The patties also make great sandwiches.It can also be made into an aloo tikki chole chaat where instead of peas curry there is a garbanzo beans curry. 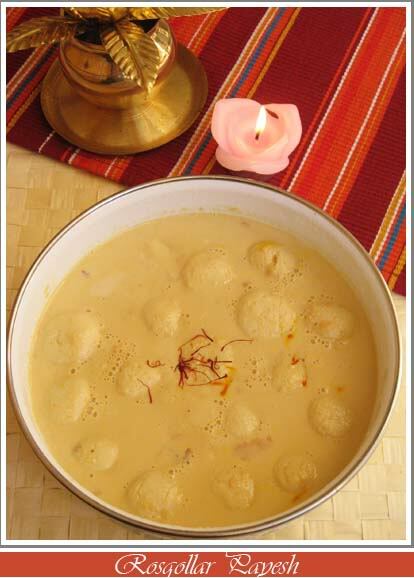 I like all the variations and for most of the time my ragda is more in the lines of a Bengali ghugni and does pair beautifully with the aloo tikki. It is a comforting dish, makes a complete meal and heals any pain you may or may not have in absence of twinkling fairy lights. Cool the potatoes and then peel.Now mash the potatoes very smooth. Next take 3 slices of bread, remove the sides, dampen by sprinkling water and add to potatoes. Mix all of the above with the potatoes and make a smooth dough. Take a little and taste. Something missing ? More spicy ? Less salt ? Adjust and add more of the spice that is missing. Now take a scoop of the mashed aloo, flatten on the palm of your hand and put on the pan. 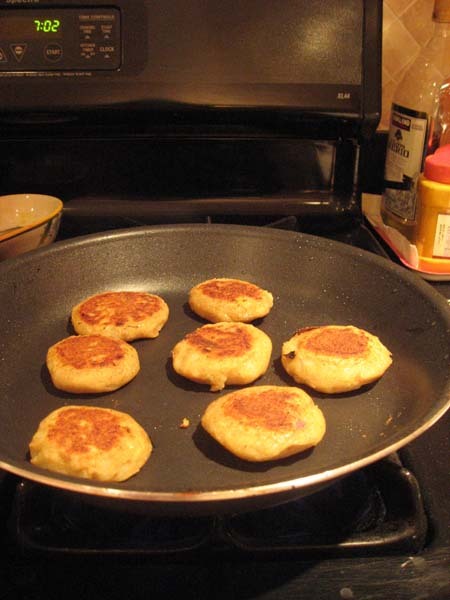 If you are using a large pan you can do about 7-8 patties/tikkis at the same time. At medium heat cook for 5 minutes and flip. You will see that the side has deep brown spots. Next cook other side for 4-5 minutes. 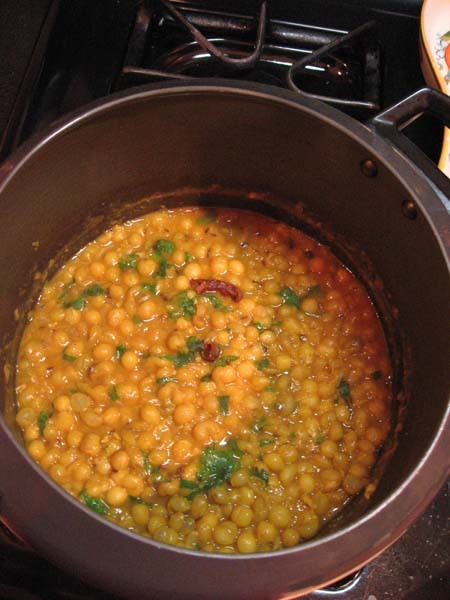 Soak 1&1/2cup of dried White peas (white vatana) in water overnight. Add the peas. Sprinkle a tsp of turmeric powder, a tsp of Red chili powder and saute for 2-3 minutes. Next add enough water so that peas are all submerged(about 3-4 cups), 2 tsp of grated ginger, salt to taste and close the lid on the pressure cooker. Cook for 5 mins at ful pressure. Once you can open the lid add a tsp of Amchur/Mango Powder, some finely chopped coriander leaves, squeeze of little lime juice and adjust for salt and spices. I often add a little beet noon or kala namak to finish off. If you like more heat add some finely chopped green chili. 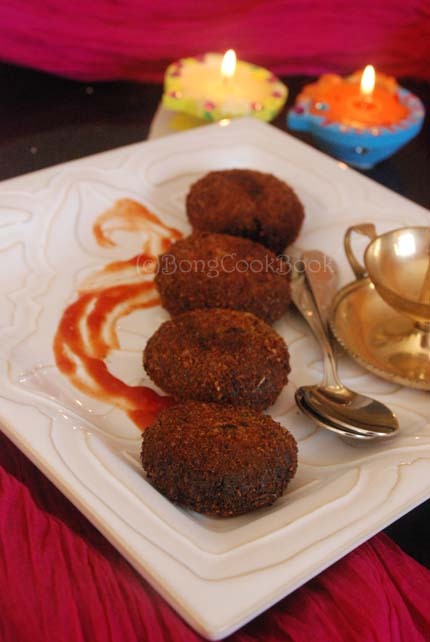 To serve the chaat arrange 2-3 aloo tikki on a plate. Ladle few spoonfuls of ghugni/ragda over the tikki. Drizzle a little Tamarind Chutney. Next drizzle little whipped yogurt. Sprinkle sev liberally on top. You can add some more chopped onion and green chili to finish. As I have been subtly hinting in my last two or three or maybe four posts there is a small something I wanted to do for the most important part of this blog today. Yes, that is Google, I am talking about. You know they host my blog on blogger and give me nifty tools like analytics to play with. Ahem. Okay, okay...who am I kidding. It is not about them. It is about you, "The Readers", as in you human drumming on the keyboard with your fingers or tapping on your phone with grotesquely long nails and looking at my blog page with a look of utter boredom. "Really, this woman", you are probably thinking, "how she wastes her time, cooking masoor dal and then writing about it. Huh!" Or you could also be someone settled down with a cup of chai in the corner couch and reading through my post, ready with perfectly sweet, polite comments to pep me up. I love you both. I like you all. I also want to thank you and you. So whoever you are stay put because the next few words I write can change your life forever. Okay, maybe not but we can hope. Now today being a sunny Wednesday and yesterday being a rainy Tuesday in my part of the world and the fact that it is also Diwali (or rather day after Diwali) and that good always wins over evil and that I love you in the theoretical sense, I would like to gift you a FIFTY DOLLARS gift card from Amazon. Now ideally I would have loved to give all of you and myself that gift card but in real world that is not possible. So I am going to have to pick one single person who can then splurge his or her way on Amazon.And splurge you can with a $50 amazon gift card. Also as we all know that happiness doubles on sharing, I will also be contributing FIFTY DOLLARS to a charity of the winner's choice and the contribution will be made in the name of the winner. Note: The charity should be a registered one and should be able to receive online payment. Here are the rules of the game. 2. Spread the word about this blog and giveaway on Facebook and Twitter. 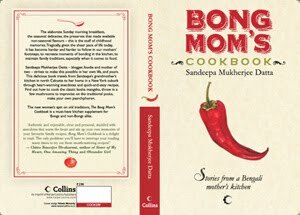 My Twitter handle is @BongMomCookBook. Shameless plug in I know but I think more people deserve to know about Indian and Bengali food, there is a whole range of tastes to explore. 3. Once you have done 1 and 2 leave a comment finishing the sentence "If I would go bungee jumping, the last dessert I would eat is ___________". If you are not comfortable doing 1 and 2, fine, just leave a comment. Please leave your e-mail so that I can contact you in case of a win. 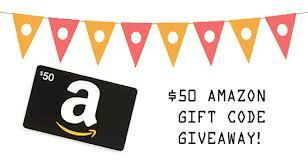 **The Amazon gift card is a global card and can be used wherever you are. However depending on your location Amazon may or may not ship certain things. That you can check with Amazon.You can also use it for buying digital entertainment stuff like apps and books for kindle. Bhoot Chaturdashi, the day before Kali Pujo, Bengalis have a tradition to light fourteen lamps and place them in fourteen dark corners of their home.Choddo Prodeep we call it. I remember rolling cotton wicks in the palm of my hand and helping my Ma light the fourteen clay prodeep which had been washed and dried in the sun all morning and were waiting ready, filled to the brim with golden Mustard oil. After the lamps were lit, came the next step, the most interesting one in this process. We had to find the darkest corners of the home to place the lamps, corners where darkness was thick and black like a blueberry jello and a flickering lamp could merely make a feeble statement . There would be one placed near the tulsi plant, one on the outside window sill of the bathroom, a third by the choubachcha -- the water tank in the backyard, and then the rest by the doorstep of each rooms. 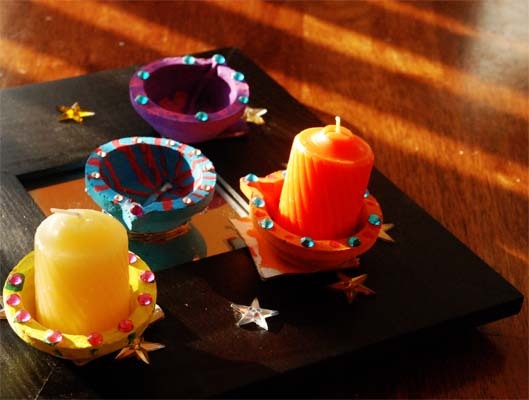 This day was all about darkness and flickering clay lamps unlike the day of Deepavali when rows of slender wax candles would be stuck around the front verandah and lighted up to dispel any essence of darkness. Bengalis also have a tradition to cook and eat fourteen different kind of greens on this day. Choddo -Shaak it is called. 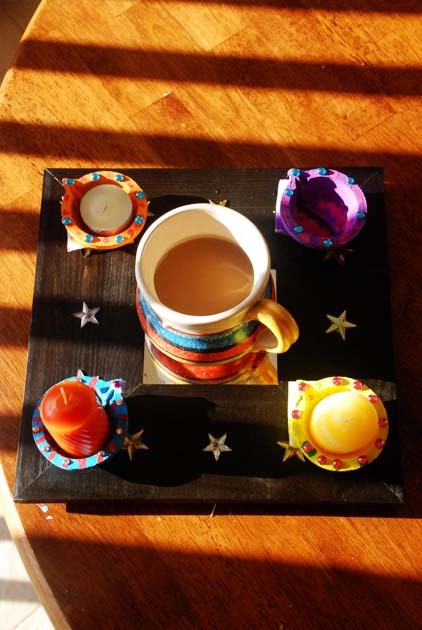 Now I can understand the logic of fourteen lamps to dispel the darkness and bring light or to pay homage to fourteen ancestors, whichever theory you live your life by. But I have never understood the worthiness of fourteen greens. I mean you buy fourteen different kind of greens, which itself is a daunting task, then you chop them up, scary prospect and then cook fourteen different kind of dishes with these greens. Why ? Really why ? Am I consuming the year's worth of Vitamin A on this single day ? So anyway the choddo shak never excites me, too much work.I would rather light lovely lamps, have a nice cup of hot tea and take pictures of both lamp and tea instead. Most that i try to do is, to cook one or two leafy greens and maintain traces of a ritual that has it origins. This year it was the simple Begun diye Palong Shaak, a classic Bengali recipe where Spinach greens are cooked with cubed pieces of eggplant in mustard oil and a Pui Shaak cooked with pumkin, eggplant and potatoes. The star of the night however were the lamps, four of which were painted and decorated by Big Sis and Little Sis. They had much fun painting them and sticking them up with jewels. 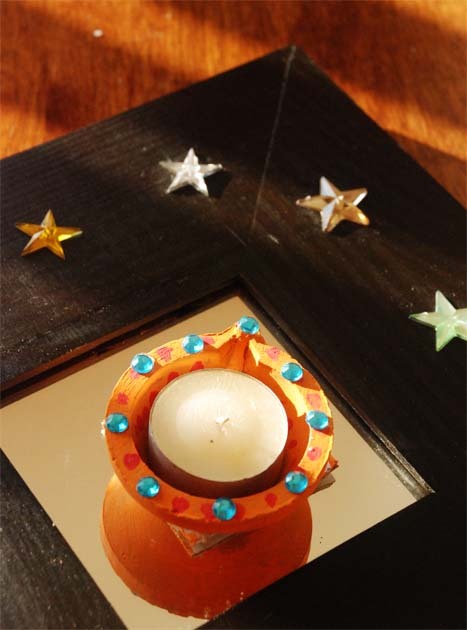 It is really an easy craft project for small kids and requires plain clay diyas,some paint and self stick rhinestones. The girls do not care for the fourteen, and we rarely light oil lamps, so this involvement in the whole prodeep thing charged them up and they waited and waited till evening fell and we lighted fourteen lamps. Add the eggplant and saute till eggplant is soft. Now add the spinach mixing it with the eggplant. Add little salt to taste, a few green chili slit and let the spinach cook. The greens will release a lot of water. Stir intermittently and let all the water dry up. Once the spinach is cooked and the dish looks dry add a little kashundi if you have some. If not finish off with a little mustard oil. Wishing you all a Happy Deepavali. Stay tuned for there is a giveaway coming up. Phewww...the last two weeks have been a tough week for folks in my part of the world as we are still reeling in the aftermath of the hurricane that made a landfall about 80 miles from my home. 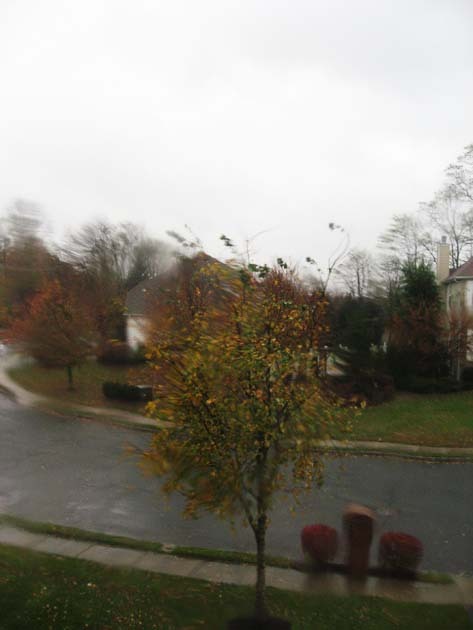 We felt the power of nature as huge gusts of wind rattled windows, my neighbor's tall willow tree swayed and finally fell, fences flew around like dry leaves in my front yard and we lost power. People have lost homes and much more and so it doesn't sound right for me to start cribbing about my loss of power for several days. I guess the power became more of a problem since no one here has a backup power source and steady supply of electricity and water is taken as granted.Schools were off, traffic signals refused to work, most businesses, stores, including gas stations were unable to operate for the first couple of days. The kids were the ones who made most of this situation though. 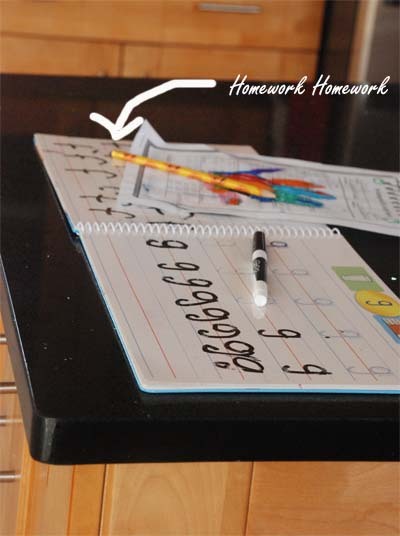 They made up games to play by the flashlight, had many fun sleepovers, spent two happy days with an aunt which would normally have not happened during school week and lived life beyond the usual routine. And it is in this chaos that I found many reasons to celebrate. That we were safe. That we had food . That we have great friends to tide us through the powerless days. That we got back power in time for election. That Little Sis can now clean her own bum.... Yes, yes that last one took me by so much surprise and admiration for LS. She is the proverbial second child, the one whose potty training just happened without my breaking my head because I waited and waited until she was ready, the one whose reading or writing I don't worry about much as I have learned that a child attending a school will eventually do those, the one who eats more candy that her sister did at this age and I just give in tired of picking up any more battles, the one who is still the baby and gets away with a lot of tantrums I wouldn't have allowed otherwise. So the fact that LS cleans her own bum at school made me really proud. At home though she refuses to do that job. Yet. She also likes "jhaal chicken" aka "spicy hot chicken". Big Sis also likes "jhaal chicken". 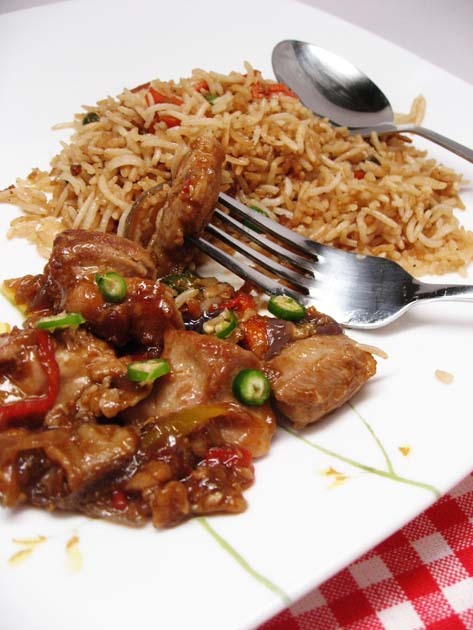 So once we got back power "chili chicken" and fried rice was made for dinner. 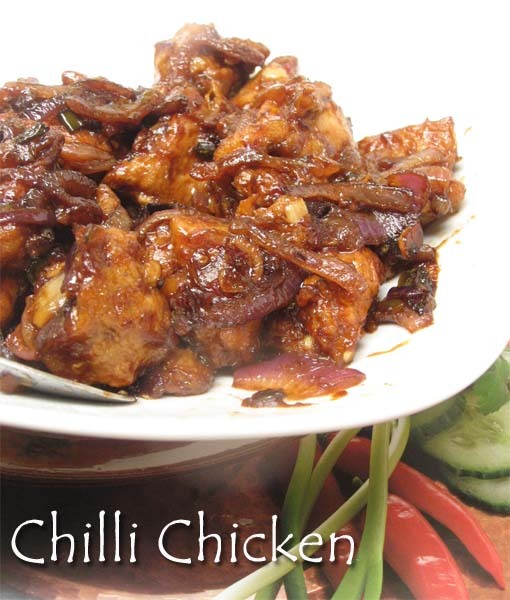 Indian Style Chinese Chilli Chicken is a hot favorite of almost every Chicken eating Indian I have ever met. The first time I had a hot, hot Indian style Chinese chilli chicken was many many years ago as a second grader at a small restaurant in the mountain town of Kalimpong. I knew very less about China at that time (not that I know much now) but my respect for the country had gone up just because of this single dish. I imagined a country where people ate Hakka Noodles, Chilli Chicken and Manchurian Fried Rice non stop for breakfast, lunch and dinner. What is not to respect. Nowadays every time I make this Chi-ll-i Chicken, I feel very very sorry for the Chinese. I mean here I am getting annoyed if someone makes alu posto in olive oil and here is the poor Chinese who is getting credited for a dish that has nothing, nothing except Dark Soy sauce as the Oriental ingredient. That is if I am in the dark about Huen Tsang's love for loads of green chilli and hot spicy chicken. With due apologies to the Chinese here is my Ma-in-law's version of the Indian Chilli Chicken. Cook it, enjoy it and never forget it. Heat Oil in a wok or kadhai or a saute pan. 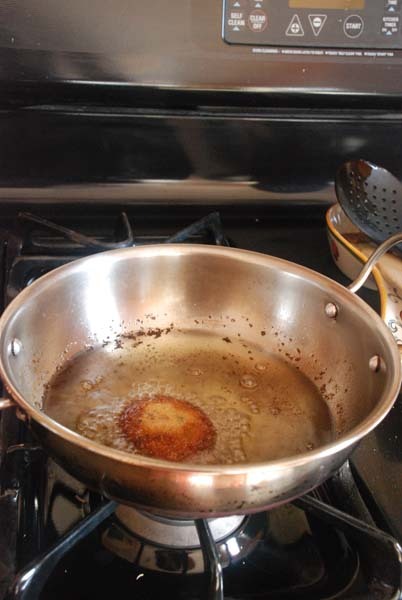 Oil should be enough for frying. Add the chicken pieces in a single layer and fry till they are golden brown. Remove the lightly fried chicken pieces and keep aside. The fried chicken will be ready to eat. Usually the remaining oil will be too much for the gravy so take out most of it and use 2tbsp of it for the next steps. When you get the flavor of garlic( careful don't burn the garlic) add 1 cup thick sliced onions. Fry till onion is pinkish brown. In about 3/4th cup of warm water mix 2 tbsp corn starch and make a smooth mix. Add this to above and mix well. When the gravy starts simmering add the fried chicken pieces & fry at medium high for couple more minutes combining the sauce and veggies till chicken is totally done and the gravy is thick and clinging. Wash 2 cups of rice in water and let it soak for 10 mins. Cook rice in enough salted water. Once the rice is cooked drain in a colander. Now heat Oil in a wok. You can use the oil that you have remaining from making the chilli chicken. To the hot oil add 2 cloves of minced garlic and some black or white pepper powder. Follow with finely chopped carrots and green peas. Add some soy sauce, salt to taste and cover and cook till veggies are done. Now add the cooked rice gradually tossing it with the veggies and sauce. Add little more oil if necessary. Finish adding all the cooked rice tossing so that all the rice is coated with the sauce and oil. Garnish with spring onion. 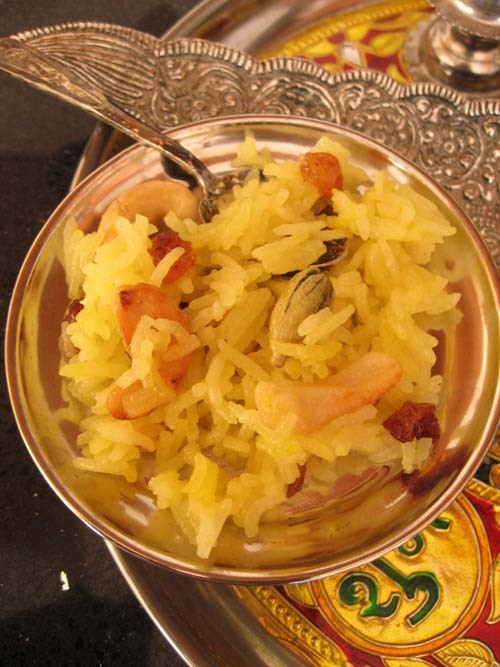 Before we go into anything let me just clarify that Meetha Chawal or Sweet Rice is not a Bengali Dish. It very well could have been given how much a Bengali loves her rice and sweet.But the point of the matter is it is not. 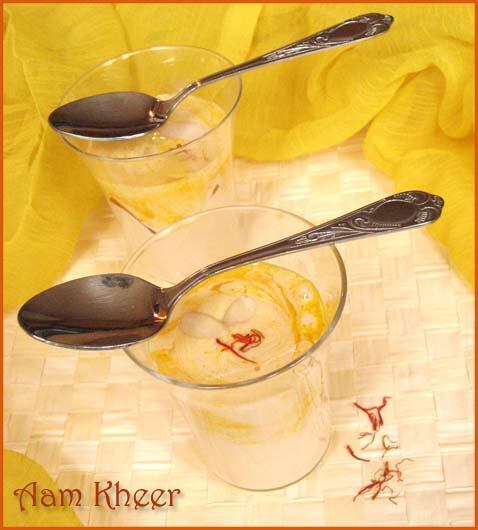 I guess this whole dish passed a Bong by and I am sure if he or she, the Bong that is, had any inkling of this dessert it would have been christened "Mishti Modhur Bhaat" and be a staple dessert to be served during Pujo and Bijoya. After all it has rice and sugar. What else doe one need ? Me, for myself, first had this at a party last year where it was cooked by a Punjabi colleague's wife. It was exquisite. 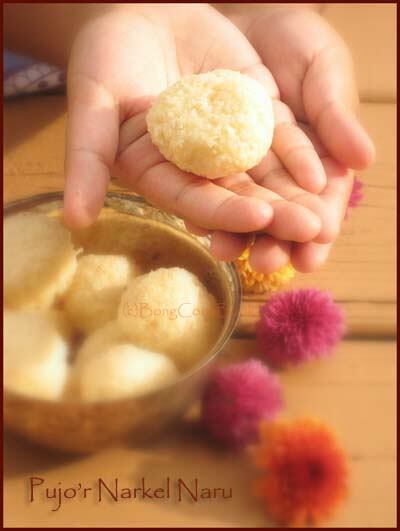 Long grains of rice sweetened with sugar and loaded in kaju and kishmis with a fragrance of ghee and saffron hanging around it. His wife was a good cook and I was sure it was a pretty difficult dish to cook involving hours of sweet labor. Turns out it can also be done in the Microwave. Now to make larger portions, the stove top might be a better option but for small quantities I found the Microwave is perfect. Durga Pujo starts this Saturday. Navratri is already in full swing. I haven't been able to take a breather to glance around and realize that. Adjusting to the new neighborhood, BigSis's new school and boxes to be opened and stowed away at every corner is taking up all our time. But somewhere in my being I do have a feeling that halfway across the globe, life is not as mundane and tiring as mine, as preparations to welcome Devi Durga have reached a crescendo. It is not that I miss it terribly and I am kind of relieved that I do not need to push aside crowds at Baagbazaar or College Square to have a glimpse of the protima but some days, sometimes, when the chores get heavy and the day drags on I want to be back there oblivious of BS's homework or my long drive or LS's nasty cough brought on by the October cold or one more box that needs to be opened and stored away. It is through this that I send you all happy wishes on Navratri and Durga Pujo. May you find joy in the path you seek and may the path sweeten lives around you. And now to the recipe of Meetha Chawal in the microwave which I made following this recipe from Tarla Dalal's site. 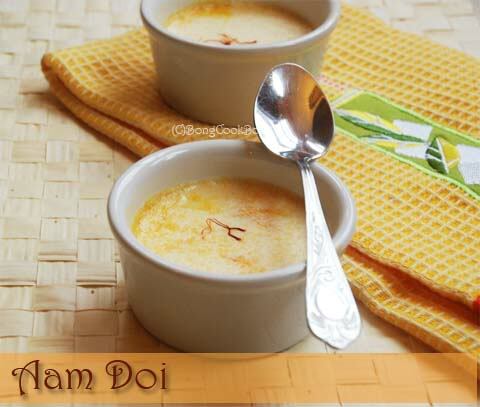 To above add 4 green cardamom, 2 clove, a 2" stick of cinnamon. Microwave again for 1 min. Drain rice and add to the bowl. 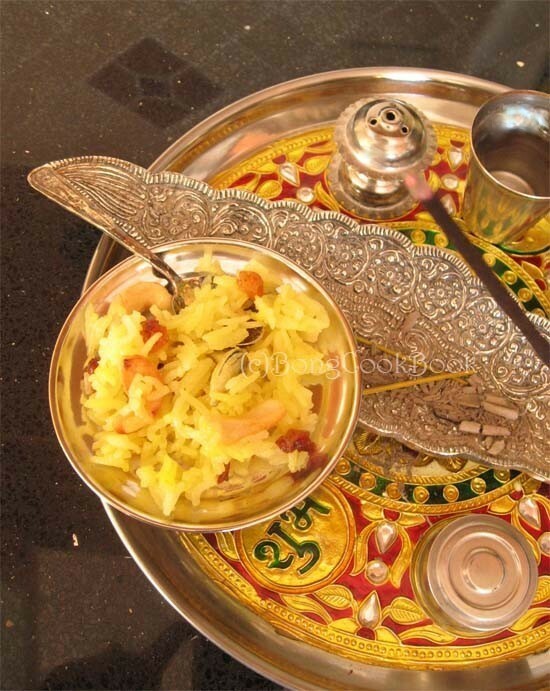 Mix so that the rice grains are coated with ghee. Microwave for 1 min. By 10 mins the rice will almost be done. This will depend on quality of rice as well as power of microwave. If not done continue for 5 more minutes till rice is almost done. Meanwhile saute cashews and raisins in ghee on the stove. Once the rice is done mix the kaju and kishmis with the rice. Serve hot. To find more of recipes like this please check the updated recipe index page at Bong Mom's CookBook Recipe Index. I usually a do a Giveaway on my blog around this time.Please stay tuned and I will announce one soon.Meanwhile enjoy Pujo. If you are the type who will spend hours standing in front of the stove coaxing a gajar to become a creamy, sweet, decadent halwa because you value time and quality and you are not the one to compromise...shoo, for this post is not for you. This post is for the types who want to be the ever sacrificing Bollywood Mother feeding sons and daughters gajar ka halwa by the pounds but not ready to sacrifice their precious nap time for it. They also do not want to serve store bought or "Maine Banaya Gits se" kind of Gajar ka Halwa. They think that takes away the glamor from the sentence "Beta, aaj maine tere liye Gajjar Ka Halwa Banaya hai". For them the 20 min Gajar ka Halwa in the Microwave comes in a super time saver pack. With this I am done with that, the stove top one, unless of course it is someone other than me sweating it out for hours on the stove top. 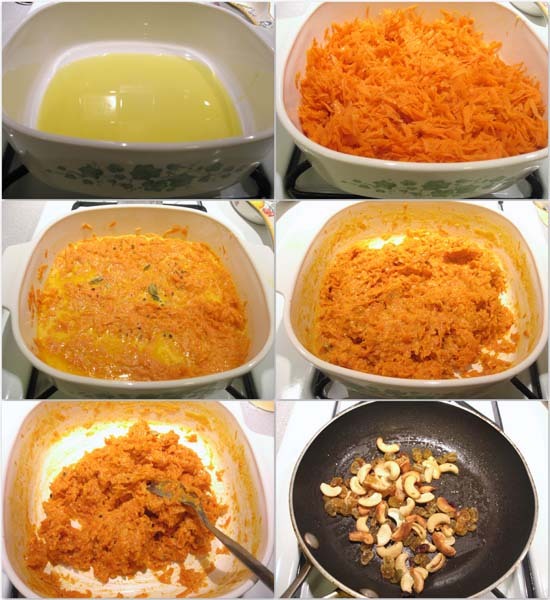 This microwave version of the Gajar Halwa was something I first had a friend's party. She, the friend, is a dessert queen of the Bread Pudding and Tiramisu fame. 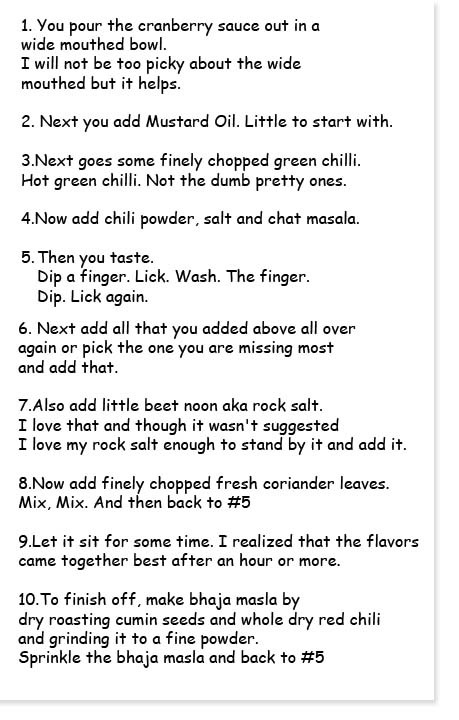 However this one time she completely ignored my e-mail and sent me the recipe only a day after I had made the darn Halwa. So the recipe I am sharing is not hers but is the one I loosely followed from Veggie Platter here, but then again all of them are almost same with little differences here and there. Red Chilies also has a version here which does not use condensed milk but uses Milk Powder. Ultimately all of them lead to the same thing...Maa ke Haath ka Gajjar Halwa or maybe Baap ke Haath ka. Who cares? Saturday Monday is Mahalaya, the occasion that heralds Goddess Durga and is the formal beginning of the Durga Pujo festival. I will not be up at 4 listening to Birendra Krishna Bhadra's chandipath on AIR But I might just make this Gajar Halwa again. You do too. Add 4cups of grated carrot to it and mix. Next microwave it for 2 minutes. Take it out. Mix uniformly with grated carrots. Put the bowl back in the microwave for around 5 mins. Careful that there are no spills. See I told you to get a deep bowl to start with. Take it out. Stir,add few strands of saffron and put back again for 5 more mins. Follow this pattern in slots of 3-5 mins till the moisture has evaporated and the carrots and milk come together in unison to form a halwa. You will know it when you see it. If you have never noticed a Gajar Ka Halwa look at the pic. In all it will take around 17-20 mins to be done. But then again it depends on the power of your microwave. Meanwhile heat a tsp of ghee and roast the cashews and raisins. Garnish the halwa with the roasted nuts and the plumped up kishmish aka raisins.If you have varak, please go ahead and freak out. I love those silvery things for garnish but had none. Ta Da. You are done and now you are all set to put your lazy self back to the couch.